Rudolph the Reindeer’s cuddly littly son to brighten uo your Christmas. He measures 6” tall sitting. A very simple little pattern which can be made out of scraps and left over yarn. Add a hanging thread and he would be a great tree trim, or use him to decorate your Christmas table. A quick and simple pattern for a child/beginner knitter to gain confidence. 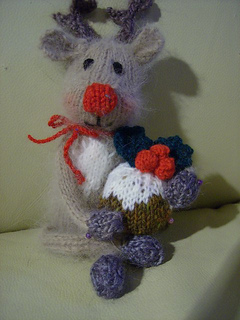 You are absolutely welcome to display/gift/fundraise/donate or sell for profit any knitted product from this design. Only the pattern itself is copyrighted and may not be reproduced in any form.